​ONLINE REGISTRATION for winter season 2017 is now open to all players Grade 1 and above. If you are using a different email address from last year please contact your enrolment officer. Winter competition commences Saturday 22nd April. It runs during second and third school terms, with a break over the July school holidays. REGISTRATION CLOSES Monday 27th February. For players to be guaranteed a team they must be registered by this date. No late registrations will be excepted. Please be aware before registering that team selection is based on last year’s winter teams. We cannot guarantee that your child will stay in the same team or guarantee a place in a team after registration closes. * Prep can register to play for summer competition starting term 4. 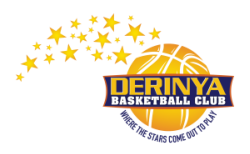 * All of last year's Grade 6 players are very welcome to continue to play for Derinya, either in last year's team or one they put together themselves. Please contact the Enrolment Officer for that age group if you require further information. Assistance with registration will be available at this time if required. Please be aware that all Grade 1, 2 & 3 teams are now wearing our new yellow uniforms. ANY QUESTIONS please contact the appropriate Enrolment Officer for your child's age group. Team registration process is the same as above. Please note that team selection for 2017 Winter Season will be based on 2016 winter teams and not summer teams.